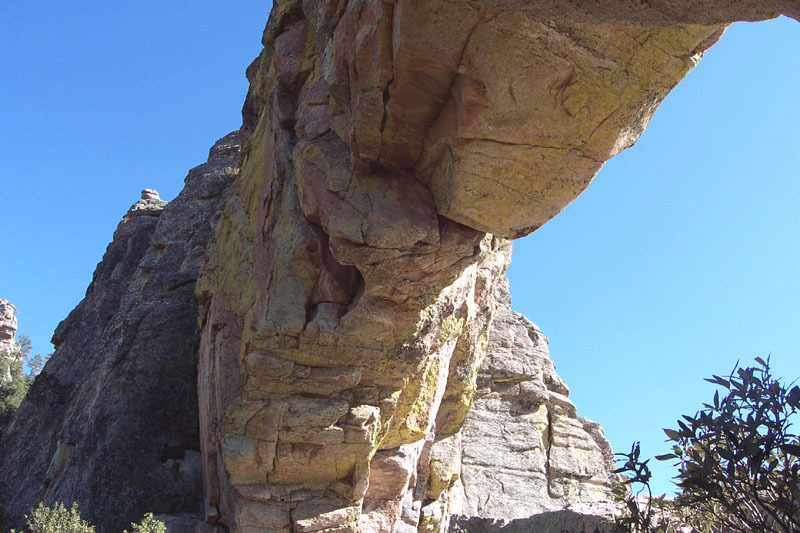 The Window is an unusual round opening through a massive rock structure high atop the Santa Catalina Mountains. 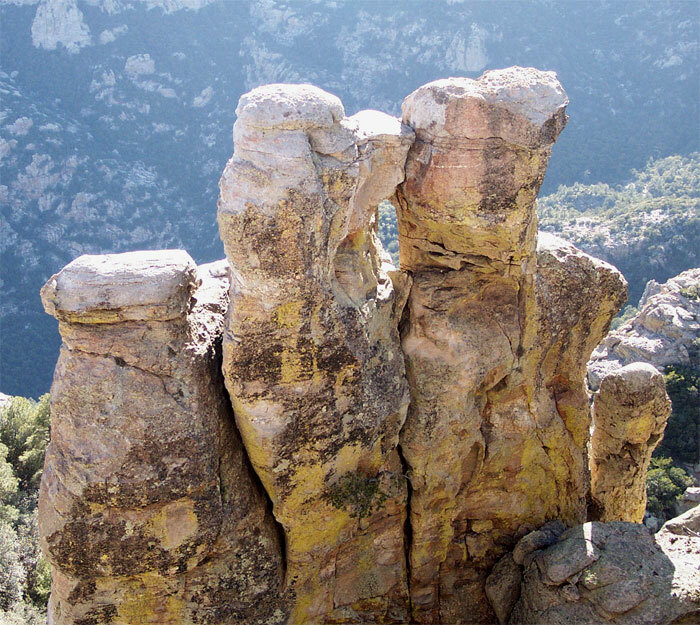 This Tucson area landmark is an alluring destination for hikers willing to endure the long, steep trek. 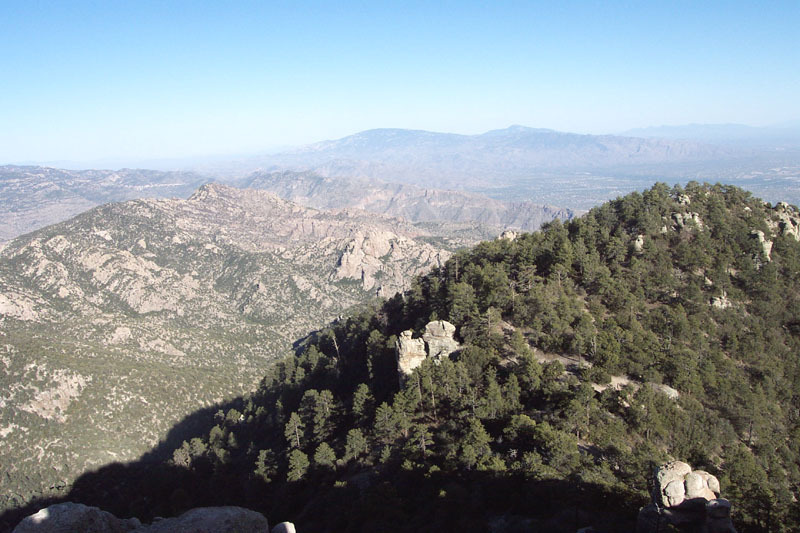 The hike up to the Window takes you from a parking lot on the edge of Tucson - through Saguaro-lined canyon country - up through oak and cypress territory - and up into forested Alpine regions. It's a terrific way to experience several ecological zones in one, long day. The reward for your hard work is a well deserved rest in the notch of the Window, with the wind racing through it cooling you off. A relatively short scamper up to the rock towers just above the Window reward you further with a panoramic view obstructed only by Cathedral Peak and Mt. Lemon. From the far end of the parking lot at Lowe's Ventana Canyon Resort, head out on the Ventana Canyon Trail at the trail sign. 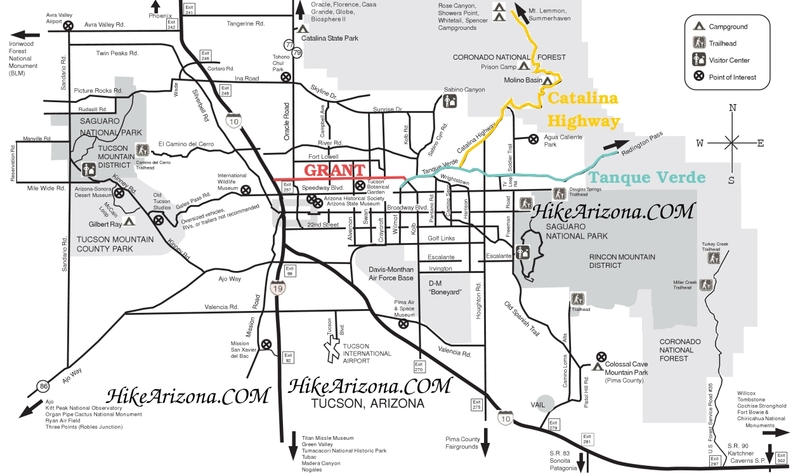 The first part of the trail takes you through classic canyon country amongst Saguaros and other local varieties of cactus. 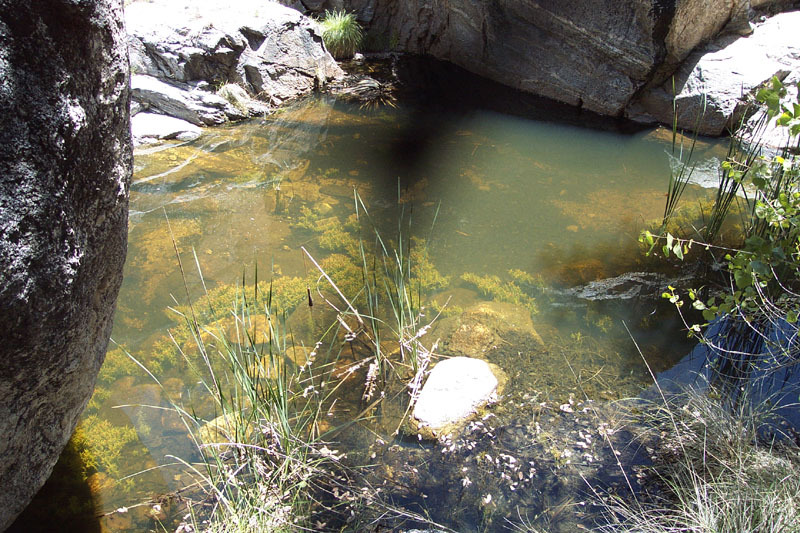 You'll trace the contours of the valley for 2.4 miles to the "Maiden Pools"- a collection of pools that populate the stream running through the valley following snow melts and monsoons. Don't let the first few miles of the trip fool you, however - it gets much steeper from here. Take your time and pace yourself throughout this trip - 4000 feet of elevation is a lot of ground to cover, and this was the easy part. 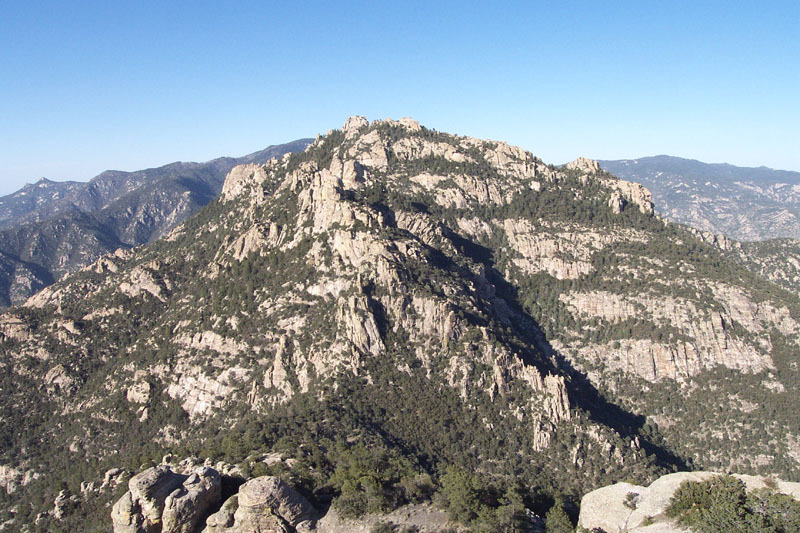 From the Maiden Pools area, the trip becomes a relentlessly steep 2.8 mile trek through the more open oak and cypress country to the intersection with the Esperero Trail, 5.2 miles from the trailhead. 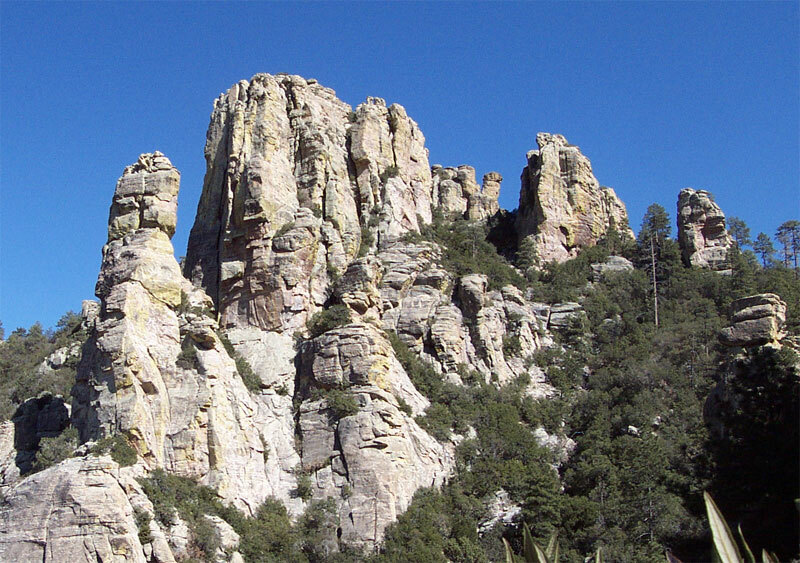 You will travel high into the valley with sheer rock formations on either side. The Window, only occasionally visible from the trail, looms above you to the northeast. 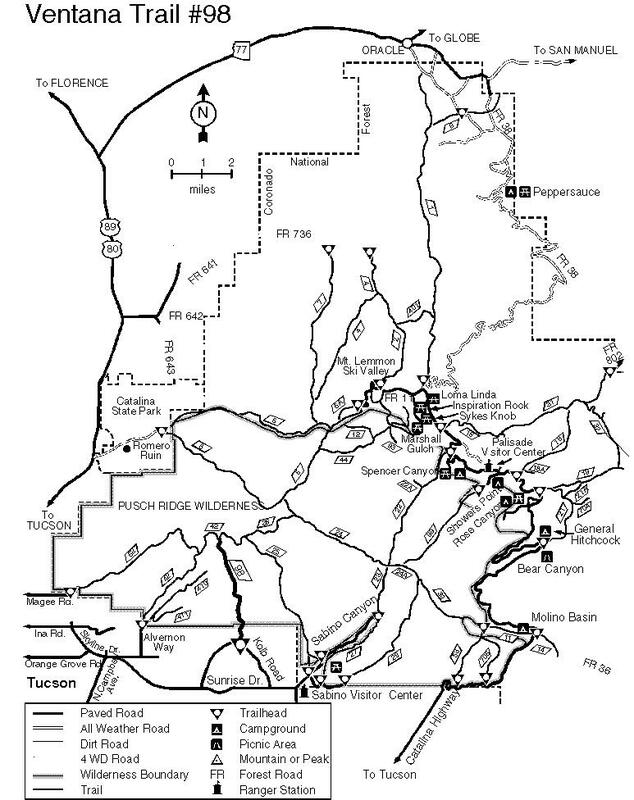 After the 5.2 miles from the beginning of the trail, the journey intersects with the Esperero Trail at a signed junction. 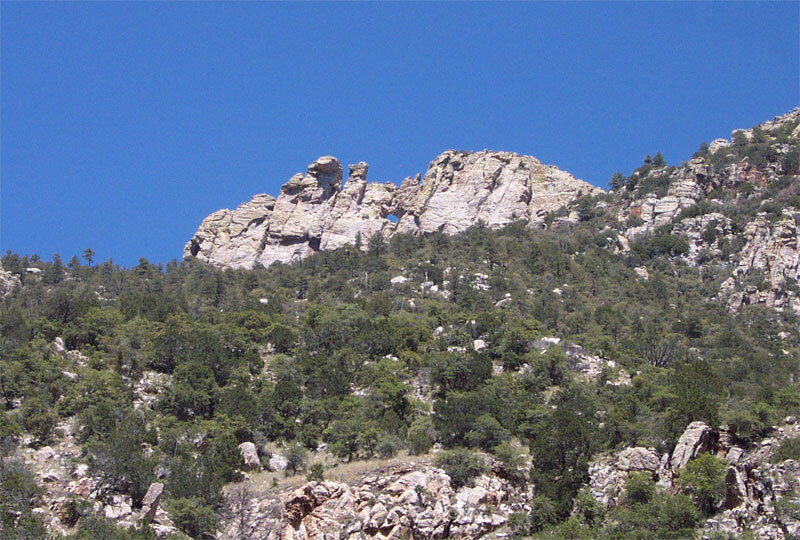 Already well into the pine forest, take a right on the Esperero Trail. 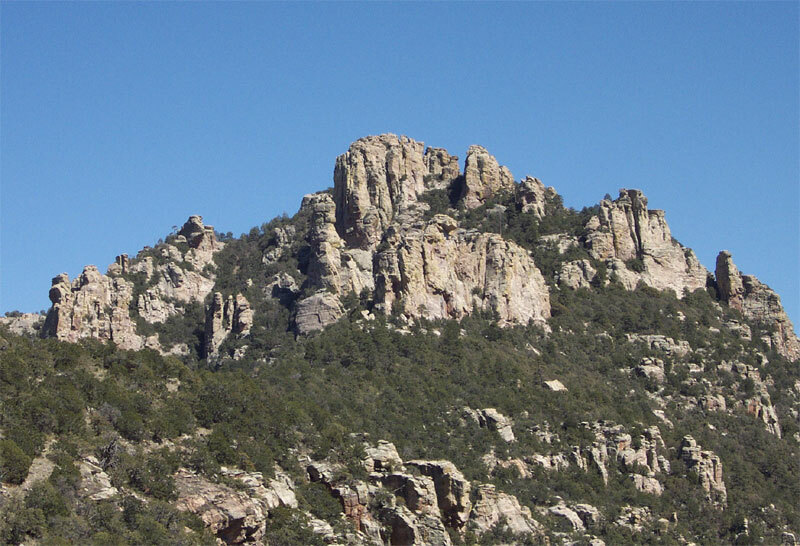 The Esperero Trail continues its relentless climb up the mountain for a short while until you finally reach a saddle overlooking the north, south and west. Enjoy the relatively level trek along the saddle, in view of the rocks containing the Window, until it marches steeply up once again to the Window. You will not be able to see the Window itself from here, but it is amongst the rock formations just up ahead of you and below the higher rock formations behind it. The trail actually takes you around and directly behind the rocks containing the Window. Climbing up the back (east) side of the rocks, the sunlight shining through the Window will mark your arrival. Climb up into the Window, take a look around and a well deserved rest. At the very least, you should continue up the trail along the back side of the rocks for a few hundred feet to the top of this cluster of rocks that house the Window. From there, you can make the easy climb up to the top of these rocks that will give you a much more impressive and expansive view than from the Window itself. If you've got the time and the energy left, you can actually arrive at the top of the towering rock spires you'll see just east of the Window (it's not far - about 1/3 mile). To do so, just follow the trail that took you to the Window up (south) and around the rocks. This part of the Esperero trail, which actually links up with the Cathedral Rock Trail, is poorly maintained and can be very hard to follow. But if you take care to stay on it (i.e. if you lose it for more than 50 feet, backtrack and you'll find it again) it will take you south, then east, then back north around the rocks to the top of another saddle above the Window. Follow the trail until you're at the very top of the saddle. The trail will continue east from the saddle to another peak (Window Peak?) and eventually to Cathedral Peak. Jump off the trail at the very top of the saddle, however, and follow the very top of the ridge straight west towards the rocks. There's no trail per se leading up there, but if you go straight west along the very crest of the ridge, you can intuitively follow the path to the top of the rocks. There's something like a trail you can follow, and I marked the final ascent with cairns. You should arrive at the upper-most rocks - at the point which is as far north as you can go without falling off the mountain - at a point between two rocks with a tree between them. Climb up the rocks with the help of the tree and you're there. You'll be able to survey the rock formations you're now on top of, the Window below you and a sweeping view of the Catalinas all around. Enjoy the view and rest-up for the long trip back. Coronado FS Reports Ventana is Spanish for window. The window in this case is a 15' by 25' opening in solid rock that tops one of the peaks in the Santa Catalina Front Range. 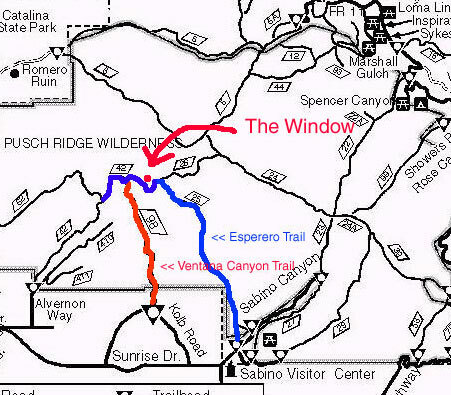 The route up Ventana Canyon leads to The Window, presenting memorable views of sheer canyon walls and a steadily broadening panorama along the way. The views back of the city are spectacular. The stream that the trail follows for much of this route is dry most of the year, but you can usually find water in some of its pools during the spring and early summer. The riparian habitat it nourishes provides good birdwatching. The trail becomes steadily more difficult to follow as it climbs farther from the trailhead and higher up the canyon. As you climb, occasional pools and widening vistas provide reasons to stop, take a breather, and look around. The Window comes into view well before you get to it, as does the 100-foot drop at its base.